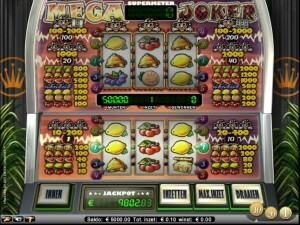 The slot machine Mega Joker is one of the classic slot machines and that is also the same as the design and the design when you open the game at Oranje Casino. It is a popular game among players who prefer gambling on classics. That is not the only reason of popularity, because this slot machine has a very high payout percentage. There are two games available with two different sets of roles. Both sets have three roles and three rows and there are five paylines available. The game distinguishes itself with a basic game, supermeter game and the possibility to win a progressive jackpot. 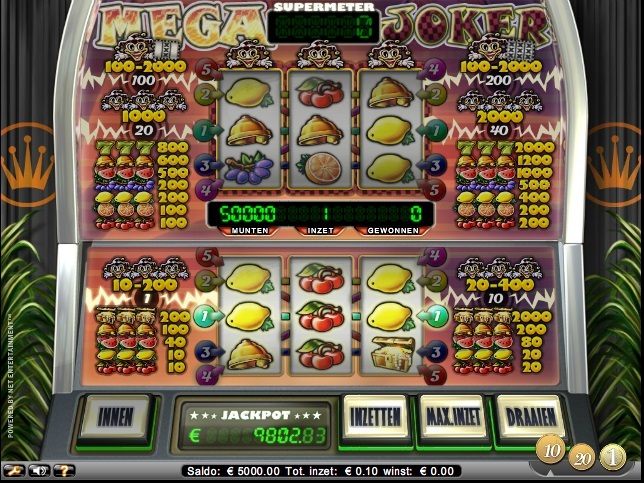 You can start gambling in the basic game of the slot machine Mega Joker and therein is the opportunity to go to the supermeter game if there is a certain combination of symbols on the reels. When playing in the basic game you can choose between coin value 0.10 euro, 0.20 euro or a coin value of 1 euro. Then the choice can be made between playing with 1 or with 10 coins. It depends on the choice to play with 1 coin or 10 coins how many paylines will be active. There will be only one payline active at the time that a bet of 1 coin is played at a time. If the choice is made to play with 10 coins, then all paylines will become active. A total of five paylines are available, so that in this case there are five paylines. There is still a difference, because the profit in the basic game with 1 coin is automatically added to the balance. If, however, a profit is made in the basic game on five paylines if 10 coins are played, the winnings can be transferred to the supermeter. Incidentally, the player reserves the option to simply collect the winnings and continue playing in the basic game of the slot machine Mega Joker. The supermeter of the slot machine offers even more opportunities to make a lot of profit and is played with five paylines on the top set with three reels and three rows. With the chosen coin value, you can still choose whether to play with 20, 40, 100 or 200. The winnings that are achieved go to the supermeter. One of the game features that makes it interesting to gamble on the slot machine Mega Joker is that a progressive jackpot can be won. The jackpot continues to grow until the moment it falls. To win the jackpot, it is of course necessary to score the winning combination of symbols. The current value can always be found at the game, so you can see exactly how much money can be won if you decide to play on this slot machine. After the jackpot falls, there is always a starting level, so that nothing is started from scratch.